The owners say they love to shoot, but enough is enough. ATLANTA — One man in upstate New York sawed his AR-15 rifle into pieces and posted a video of it on Facebook. A woman in Connecticut did the same with her handgun. Not far from scene of the Florida high school shooting, another man brought his assault weapon to police and asked them to destroy it. Scott Pappalardo is one such gun owner. Sitting in the backyard of his home in Scotchtown, New York, cradling the Eagle AR-15 rifle he’d owned for 30 years, Pappalardo called himself a firm believer in the Second Amendment who considers the rifle his favorite, but said he’s pained by the steady drumbeat of mass shootings. With that, he turned around and put a saw to his rifle, and posted the video with the hashtag (hash)oneless, calling it “My drop in a very large bucket.” That was Feb. 17, and 5 days later, it had received more than 375,000 likes and been shared more than 425,000 times. But he believes the AR-15 has become a weapon of choice for too many mass shooters – used in Parkland, Las Vegas, the Orlando nightclub shooting, last year’s Texas church massacre and other recent high-profile attacks – and he no longer wanted to be associated with it. Despite the recent outrage, the AR-15 remains an incredibly popular weapon across America, and the people destroying them represent a small fraction of the gun’s owners. Chris Waltz, president and chief executive of AR15 Gun Owners of America, called these acts kneejerk reactions that wrongly blame the rifle. He laments that so many mass shooters have been using the AR-15 to carry out their carnage, even as handguns remain the weapon most used in mass shootings. His group has more than 550,000 Facebook followers, adding 10,000 more in recent days. Destroying the weapon “makes no sense at all,” he says. 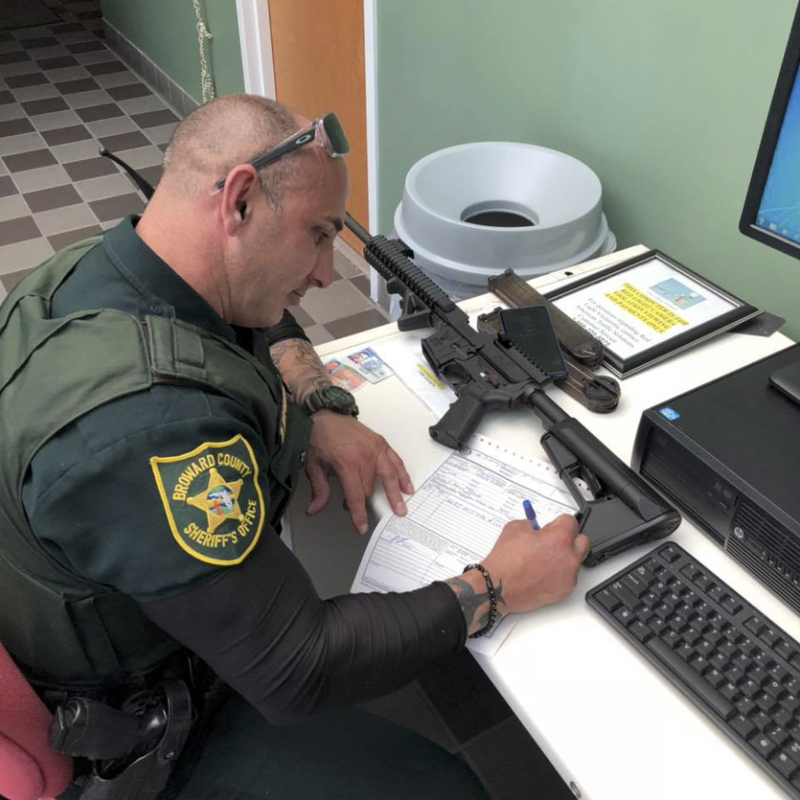 Ben Dickmann, who lives near Parkland, brought his AR-57, a variation of the AR-15, to Broward County sheriff with instructions to have it destroyed. “I enjoyed shooting this rifle immensely but I don’t need it, I have other types I can shoot for the same enjoyment,” he wrote in a Facebook post showing images of the firearm and an officer processing the paperwork to destroy it. His post, like others using Facebook to publicly declare what gun owners have done, attracted thousands of comments that offer a glimpse into the nation’s gun debate. Some accuse him of being a wimp or somehow deranged. Others praise him. She grew up in Iowa and first learned to hunt at 14. Five years ago, she bought a Sig Sauer P229 handgun to target shoot and for self-defense. She had been thinking about getting rid of it for months, but was worried it could wind up in the wrong hands. “After what happened in Florida, I just thought, this is ridiculous, I’m attaching myself to this inanimate object that its sole purpose is to kill humans,” Meyer said.